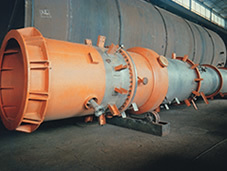 Our reference include more than 1100 shop fabricated pressure vessels & fixed floating head heat exchangers. Our Fabrication Plants have a combined annual steel fabrication capacity of 20,000 Mt. We are situated on arterial Highways with a combined area footprint of 160,000 Sq.m. We are close to major Indian Ports and have shipped Over-Dimensioned Shop Fabricated Equipment weighing up to 500 Mt. in a single piece. 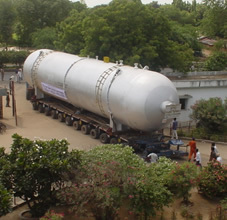 We are suitably geared to handle logistics for movement of heavy equipment. VTV holds ASME “U”, “U2” stamp accreditation, National Board registration and can fabricate vessels with “CE” marking. Our Quality & Welding Engineers have developed Welding Procedures for an extended metallurgy–process matrix. We deploy SMAW, SAW, FCAW, GTAW, GMAW processes and have handled metallurgies including Carbon & Low Alloy Steels, P 11, P 22, Alloy 31, Alloy C276, Alloy 5083, Heat and Creep Resistant Steels, 9% Ni Cryogenic Steels, Nickel Alloys, Aluminium Alloys, Austenitic & Ferritic Stainless Steels, Duplex Stainless Steel, Clad Steel, Hastelloy, Inconel, Monel & Cupro Nickel. Our strength lies in our people and the diverse exposure we are able to provide them. With an experienced core team providing powerful leadership at all our facilities, we strive to distinguish ourselves as an active player in the global firmament of equipment fabricators.